Description "Chairman Mao's Writings Sparkle Like Gold" After the so-called "Gang of 4" was arrested, people did go out to celebrate in many ways. 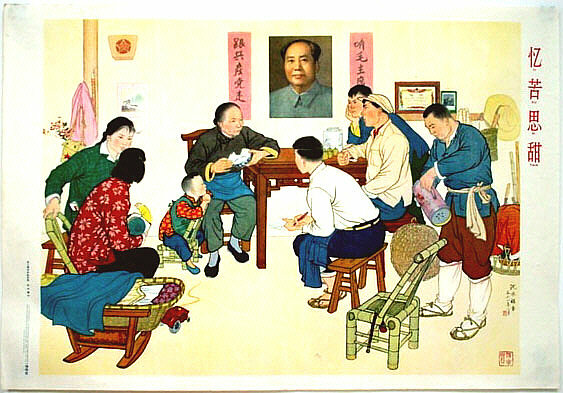 One of these was the official campaign to go out and celebrate the publication of the fifth volume of Mao's Selected Works as shown in this particular poster. Description "The Big Combat at the Qu Gu River" Huxian Peasant Paintings were internationally acclaimed for their naive, colorful style in painting and were given the opportunity to exhibit their work in Paris in 1975. This is one of the paintings exhibited. Note: This image and also the title has some roots in traditional Chinese folk art prints (so-called Chinese New Year prints). 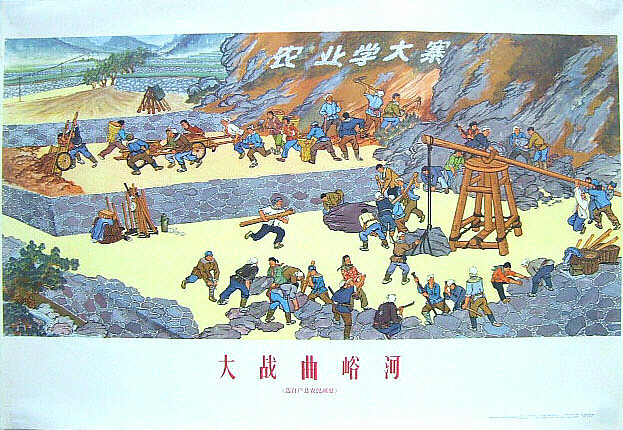 Scenes with titles like "Combat at .... River" are frequent in Chinese Folk Art prints and show historic battle scenes. 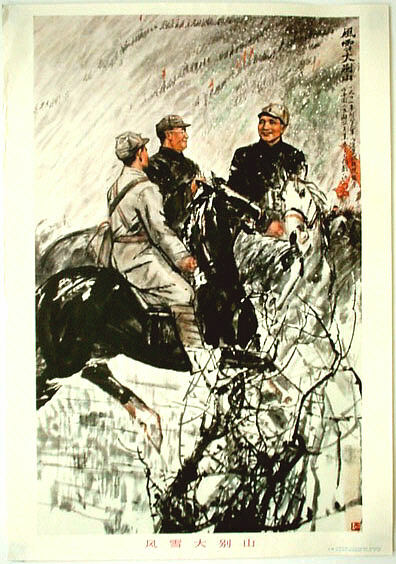 Description "Brave the Wind and Snow on the Da Bie Mountain" It's a rare poster featuring Deng Xiao-ping and He Long (one of the most famous marshals who had founded the PRC)presented in Chinese traditional painting style. Deng's poster is very uncommon mainly because he maintained to be low profile and was against any kind of personal worship/propaganda. 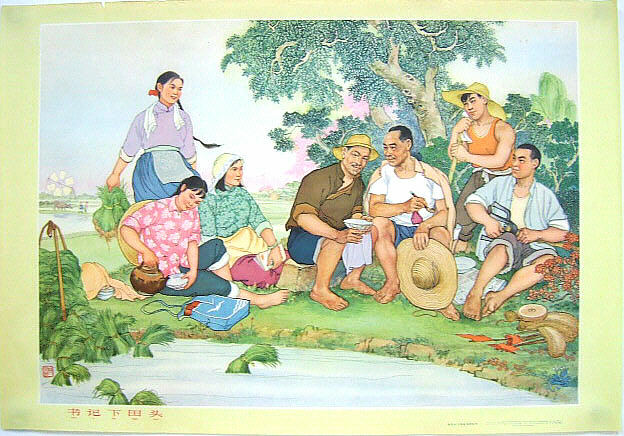 Description "Recall the Past Suffering and Think Over the Source of Present Happiness" An old peasant lady telling her true story to the younger generations, recalling the bitter days when they were cruelly exploited by the landlords and how they were then saved by Chairman Mao. 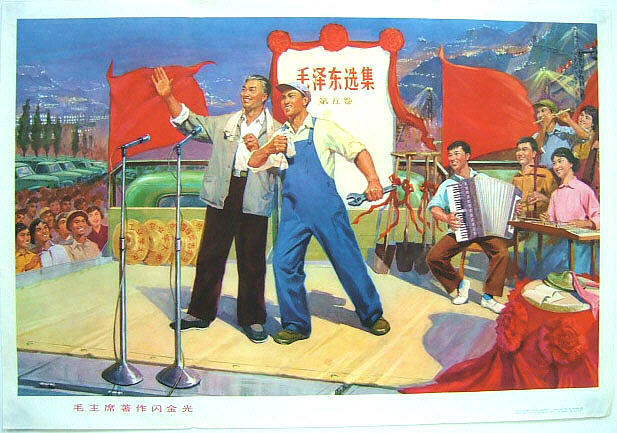 Throughout the Cultural Revolution, the peasant class had been very supportive to Mao. 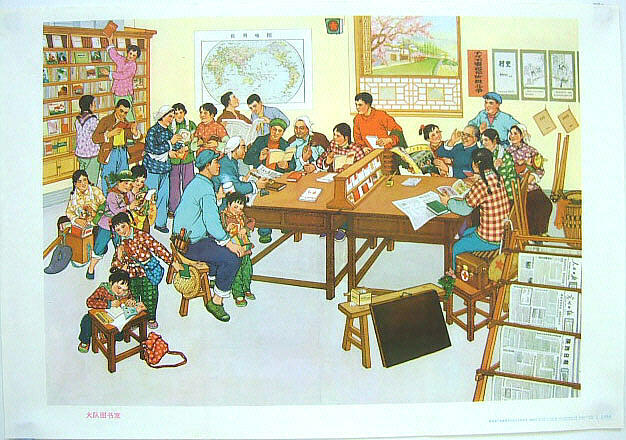 Description "The Commune Library" One of the most famous Hu Xian (a county in Shangxi) peasant paintings depicting a vivid scene of people from all ages earnestly learning Mao's teaching and publications. 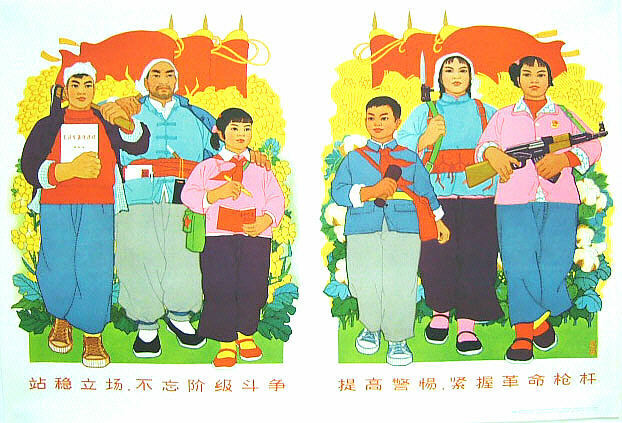 Description "Stand Firm and Never Forget The Class Struggle; Stay Alert and Hold Tight Your Arms" A symbolic new year poster (Nianhua) issued right before the Cultural Revolution. The fists of the peasants/workers are as big as their heads. Females are portrayed to be as strong and healthy as the men. It reflects what an "ideal" family looks like at the time. Description "The Secretary of the Party Committee Works with Us in the Field" A great co-artwork by 3 of the most famous artists, namely Wu Xin-qin, Jiang Nan-chun and Wu Guang-hua. 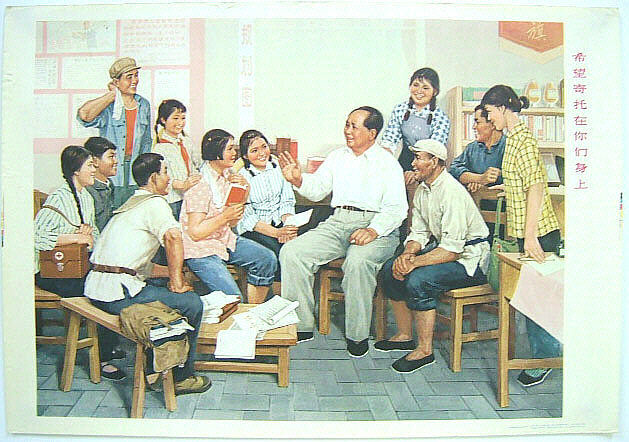 Description "My Hopes are Laid Upon You" Chairman Mao sharing his experience with a group of educated urban youth who had been sent up to the mountains and down to the countryside. As Mao's saying goes, "It is imperative that educated youth go to the rural areas to be reeducated by the poor and low-middle peasants." 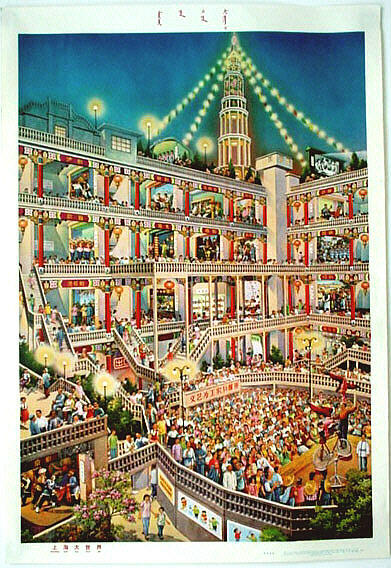 Description "Shanghai Big Big World" The Shanghai Big Big World was Shanghai's most popular amusement ground in Shanghai in the 1950s and 1960s. Soon after the commencement of the Cultural Revolution, it lost its glamor and became a mere place of government propaganda. No matter how, the place is still much remembered by the older generation Shanghai people. 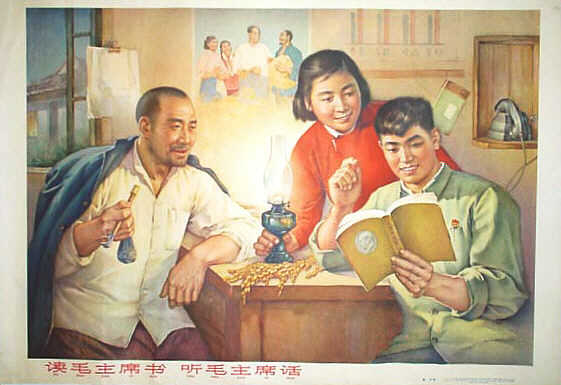 Description "Read Mao's Writings and Listen to Mao's Words" Two educated urban youth are studying Mao's writings with a peasant (probably the one who is assigned to take care of them and who they live with). What makes this poster interesting is while you can find a telephone in the room, they obviously do not have electricity to power a light. In reality, only very limited houses in the rural area may have had electricity supply at that time, not to mention a telephone.